gals there just want to learn about paddling, and how they can improve! So positive! OK, the race. Basically I had a great battle with Nikki Mocke most of the way. I picked quite a shallow line, and I was gunning it, enjoying the ever-increasing runs that where being generated by the improving wind conditions. Nikki started to follow my line, and I managed to open a nice gap on her. Then she went deep. I think that was great move on her part as I seemed to hit a lot of current head on! I managed to keep in the game for a while longer, but in the last few km’s, she got ahead, and I just couldn’t seem to get going. I was catching some fantastic runs, but think that the current was maybe just too strong. What a great race though, nice and tactical. At this point in the year, with the amount of training I have done, I am pretty stoked with my fitness levels. There is still a whole year of racing ahead, and I am going to build into it this time around! 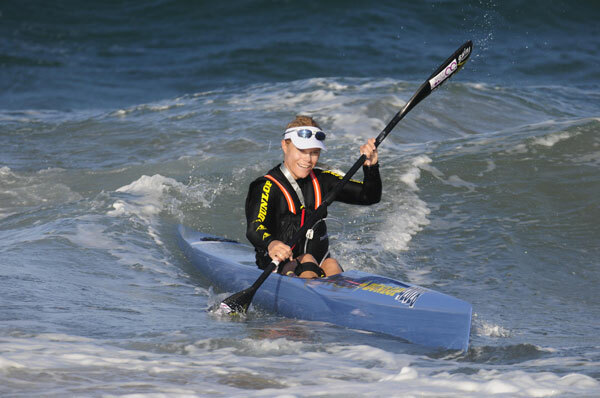 Next up is EP Marathon Champs this coming weekend, and then SA Marathon Champs in Plett on the 12/13 June. July is looking quiet, a nice time to put some solid training in, as August is looking pretty exciting, maybe a US trip, and then Portugal for 2 races! I have my new Nelo ski and Vanquish 3 K1. WOW! What amazing boats. Have been putting some time into the ski, and am loving the comfort of it. I can get a full rotation in, so my back is loving me! Even the Chiro agrees I will post some photo’s soon! Also loving my New balance kit and shoes. New sponsors rock!